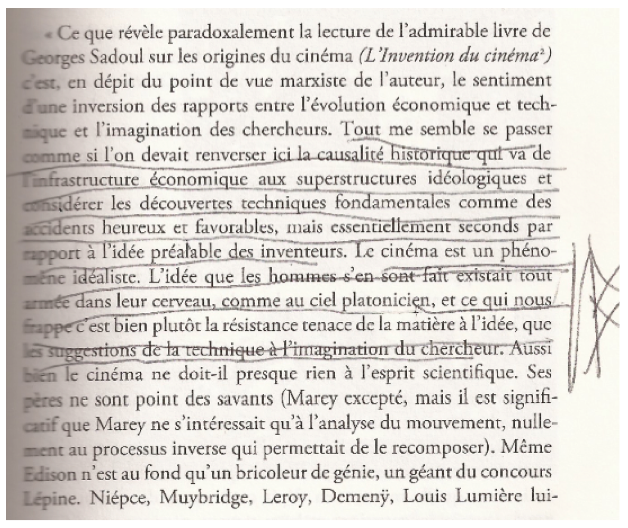 I argued in Le temps du cinema – the third volume of Technics and Time, translated as Cinematic Time and the Question of Malaise – that we must refer to arche-cinema, just as Jacques Derrida spoke (in Of Grammatology and beyond) of arche-writing. I propose today that, in principle, the dream is the primordial form of this arche-cinema – and this is why an organization of dreams is possible. The arche-cinema of consciousness – of which dreams would be the matrix as arche-cinema of the unconscious – is the projection resulting from the play between what Edmund Husserl called, on the one hand, primary and secondary retentions, and what I, on the other hand, call tertiary retentions: the hypomnesic traces (i.e., mnemo-technical traces) of conscious and unconscious life. There is arche-cinema to the extent that for any noetic act – for example, in an act of perception – consciousness projects its object. This projection is a montage, of which tertiary (hypomnesic) retentions form the fabric, as well as constituting both the supports and the cutting room. This indicates that arche-cinema has a history – a history conditioned by the history of tertiary retentions. It also means that there is an organology of dreams. A temporal process occurs through the continuous aggregation of primary retentions: time only passes because the present instant retains within it the preceding instant. In the temporal flux or flow of sensible intuition that is perception, consciousness apprehends the perceived by primarily retaining data that it selects on the basis of those secondary retentions (memories of past experience) constituting the selection criteria in the flow of primary retentions. Each consciousness is constituted from specific secondary retentions that weave its experience, i.e., its memory. It is for this reason that, confronted with the same object, two different consciousnesses experience two different phenomena: these phenomena are projected by the consciousnesses. This projection also projects protentions, i.e, expectations. The arrangement of primary and secondary retentions with protentions constitutes an attentional form: attention is what is woven between retentions and protentions. Just as it is necessary to distinguish primary and secondary retentions, so too is it necessary to distinguish primary and secondary protentions. Secondary protentions are contained and concealed in secondary retentions, whereas primary protentions are inscribed within primary retentions – so that they activate, in passing into secondary retentions, associative modalities such as those described by David Hume (contiguity, resemblance and causality). secondly, the way in which secondary retentions select primary retentions in the temporal flow is the result of the interplay between two types of secondary protentions contained and hidden in secondary retentions: some of these secondary protentions, which become practically automatic, constitute stereotypes, i.e., habits and volitions; while others constitute traumatypes – which are either repressed, or expressed by default in symptoms and fantasies. or activate stereotypes, which means that the phenomenon of the object is its impoverishment, and that the attention that consciousness has for this object fades away, disindividuating itself by reinforcing these stereotypes. The constitution of phenomena, woven from the stereotypes and traumatypes that a consciousness thus projects onto an object, is the result of attentional forms that are conditioned in specific ways by tertiary retentions that support secondary retentions. These are, in fact, woven from collective secondary retentions, which are elaborated and transmitted from generation to generation, forming symbolic milieus that metastabilise what Gilbert Simondon called the transindividual, i.e., signification or meaning. For example, the memory of secondary retentions is, to a significant extent, composed of verbal traces that are themselves conditioned by a language that is inherited by that consciousness – or by what I refer to as the psychic individual. To put this in the language of Simondon, psychic individuation is always inscribed in processes of collective individuation through which it shares collective secondary retentions, which form meanings, i.e., the transindividual. The transindividual is formed in and by circuits of transindividuation at the core of which there forms a compromise between diachronic traumatypes and synchronic stereotypes – stereotypes forming significations as common usages, and traumatypes forming meanings or object investments that disrupt common usage. The transindividual can only metastabilise itself because it is supported by tertiary retentions, i.e., technical supports of various kinds. Technical objects in general are themselves such supports, and they form what André Leroi-Gourhan described as the third memory of technical and noetic life, appearing two million years ago: beyond the common genetic memory of the human species and the epigenetic memory belonging to each individual human, there is an epiphylogenetic memory constituting the various forms of inherited and transmitted human knowledge, and through which the transindividual is metastabilised. It should be noted here that technical and hypomnesic objects play a major role in the dream as analysed by Freud in his Interpretation of Dreams, and that desire is constituted in Freud around the fetish, i.e., the artefact – which means that, like the artefact, the libido is detachable and can move from organ to organ (both artificial and corporeal). Rupestral (i.e., composed of or inscribed on rock) mnemo-technical supports appear around thirty thousand years ago, and they project mental contents outwards; constitute hypomnesic tertiary retentions; and initiate a process of grammatisation. Grammatisation, as I use the term, refers to the process by which the mental temporal flows experienced by the psychic individual are recorded, reproduced, discretised and spatialised. 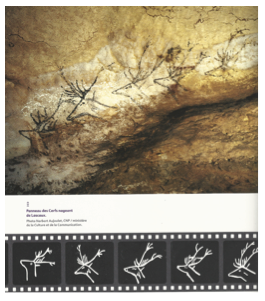 When we see the Chauvet-Pont-d’Arc cave paintings in the Ardèche, we are aware we are seeing the traces of what was seen and experienced by those who painted them. We are aware that we are accessing a new empathic possibility that did not exist prior to the Upper Paleolithic era, even though it is also true that those tertiary retentions that every object constitutes already allow us to access the artificial memory of a form of life that is itself artificial, and of which we are the inheritors. The appearance of hypomnesic tertiary retentions results in new regimes of individuation through the play of primary and secondary retentions and protentions that constitute attention: this leads to new attentional forms. On the basis of the example of the melody that Husserl used to construct his concept of primary retention, I have tried to show that tertiary retention conditions the interplay of primary retention and secondary retention, and therefore the interplay of primary protention and secondary protention; I have highlighted the fact that the analogue tertiary retention of the phonogram, insofar as it enables the identical repetition of the same musical temporal object, results in a new primary and secondary retentional and protentional experience of a piece of music. In fact, each repetition manifestly generates a difference from out the same object, and this experience of the production of difference through analogue repetition constitutes a new experience of music itself – a new form of experience that is a new form of attention, dating very precisely from 1877. There is no doubt that this contributed to the musical experience inaugurated by Arnold Schoenberg as well as to what is called acousmatic music. This new attentional form in fact considerably dramatises and intensifies the difference between two forms of repetition (those referred to by Gilles Deleuze in Difference and Repetition  ): in the first case, stereotypical protention repeats itself and exhausts the object because the phenomenon it generates is a little weaker each time until, in the end, disappearing; in the other form of repetition, however, the object generates new phenomena every time, intensifying and deepening its difference. Similarly, cinema is a new experience of life that begins in 1895. These dates, 1877 and 1895, constitute two immense turns in the organological history of the power(s) to dream. Between stereotypes and traumatypes there is interplay involved in the putting to work of secondary retentions and protentions that select primary retentions and protentions, and this interplay is over-determined by tertiary retentions as the organological conditions of repetition. As such, a tertiary retention always constitutes a kind of transitional object in Donald Winnicott’s sense, according to which the first retentions and protentions that form the psychic apparatus of the baby are articulated with the retentions and protentions of its mother via the transitional object that opens the transitional space of play. I argued in What Makes Life Worth Living that the transitional object is a pharmakon, in fact the primordial pharmakon – just as, for Plato, writing was a pharmakon, and as all tertiary retention is a pharmakon, i.e., a poison and a remedy. Winnicott showed that the transitional object, which is the condition of the formation of the infantile psychic apparatus, can also become a pathogenic factor if the mother fails to locate the therapeutic value of the object, thereby allowing it to become an object of pure addiction. Tertiary retention, which is itself irreducibly pharmacological, is what Socrates grasped for the first time in the Phaedrus in relation to writing – this being a literal (i.e., lettered) form of tertiary retention. Socrates showed that literal tertiary retention can bring about short-circuits in the interplay of psychic secondary retentions and can result – via collective secondary retentions that form topoi (commonplaces) – in stereotypical ways of selecting primary retentions, i.e., it can disindividuate collective individuals and psychic individuals, and transform them into crowds and masses. It is because analogue tertiary retention is also such a pharmakon that Walter Benjamin could be concerned about the importance of radio to Italian fascism, that this radio could support the language of the Nazi Third Reich (as Viktor Klemperer described), and that Theodor Adorno and Max Horkheimer were able to suspect cinema of short-circuiting the transcendental imagination. And yet, I argue that tertiary retention in general, and literal tertiary retention, analogue tertiary retention and digital tertiary retention in particular, all also constitute positive pharmacological possibilities, i.e., they generate new attentional forms, forming therapeutic practices from those pharmaka that are tertiary retentions. Cinematic art is one such case. From these general considerations, I would like now to return to the question of arche-cinema, of which the dream is the primordial form, in order to pose the question of an organology of the dream in general. On the basis of this question, I would like to investigate the future of cinema in the epoch of digital tertiary retention. I argued in the third volume of Technics and Time that Adorno and Horkheimer, by placing themselves within the Kantian perspective on the transcendental imagination, closed off all possibility of thinking a positive pharmacology of the cinema – i.e., of the cinematic art itself. For in fact, the cinematic pharmakon as art is what makes it possible to struggle against the cinema as toxic pharmakon, i.e., against that which enables the play of the traumatypical secondary retentions and protentions of psychic individuals to be short-circuited by reinforcing their stereotypical secondary retentions and protentions. Adorno and Horkheimer did not take into account that the three syntheses of the imagination described by Immanuel Kant presuppose a fourth synthesis, which I call the technological synthesis of the imagination, i.e., tertiary retention. The first three syntheses (apprehension, reproduction and recognition) describe and correspond to the interplay of primary retention (apprehension), secondary retention (reproduction) and protention (recognition). I have tried to show, however, by re-examining the Kantian example of numeration, that this schematism – as projection by the transcendental imagination of pure concepts of understanding in the ‘manifold of intuition’ (i.e., in the retentional flow that constitutes phenomena) – presupposes schemas that are themselves constituted through tertiary retention, and on the basis of sensorimotor schemas. The consequence of this point of view is that so-called transcendental imagination presupposes a primordial exteriorisation of memory and therefore of the imagination itself, i.e., of anticipation and temporalisation – such that, passing through artefactual schemas configured by technical organs as tertiary retention, it is supported by a spatialisation. Tertiary retention in general is the spatialisation of time enabling its repetition and its exteriorisation, and the trans-formation of the time of retentions and protentions into a space of retentions and protentions. 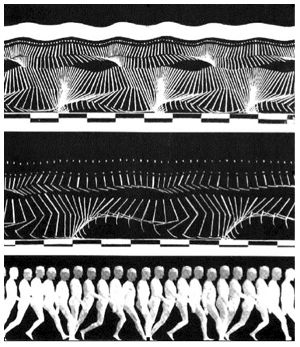 In a general way, all technical production of the technical form of life, by the desiring and dreaming beings that we are, constitutes such a spatialisation of experience, thereby also enabling its intergenerational transmission: such is epiphylogenesis, which constitutes the origin of what Georges Canguilhem called the technical form of life insofar as it breaks with the conditions in which life had evolved up to that point – breaking with evolution as conceived by Charles Darwin. It is this rupture that constitutes arche-cinema, establishing a libidinal economy of movement. What I call tertiary retention is what Derrida called the supplement, insofar as it has a history, i.e., as the genesis of technical concretisations of arche-writing (or the arche-trace). I am not in complete agreement with Derridian theory stricto sensu, to the extent that it does not seem to me to distinguish primary retention, secondary retention and tertiary retention as such. In this, my theory of the arche-trace (so to speak) – which is not only arche-writing but arche-cinema, i.e., a system of editing and post-production of primary, secondary and tertiary retention and protention (which constitute differentiated regimes of traces) – differs considerably from the exposition in Of Grammatology because, above all, I think the supplement essentially in relation to tertiary retention, i.e., to technics; whereas, for Derrida, the arche-trace constitutes the living trace in general – well before the appearance of tertiary retention. In any case, within this framework, the history of the supplement means the history of tertiary retention, within which we must distinguish between epochs. In particular, the epoch of grammatisation must be distinguished: grammatisation as the capacity to project mental, temporal contents into spatial forms. 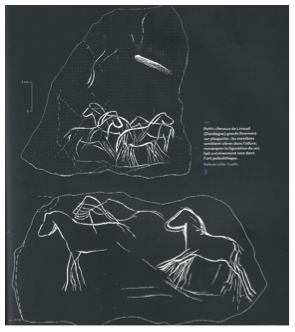 It seems that this possibility, which appeared during the Upper Paleolithic Era, brought about the emergence of what the archaeologist Marc Azéma describes in La préhistoire du cinéma as the origin of cinema, insofar as it brought with it the discretisation and proto-reproduction of movement; the cinema that appeared in industrial form in 1895 would be the mechanical culmination of such movement. In other words, arche-cinema – which constitutes the omnitemporal conditions in which, in a general way, the technical form of life (which is also the noetic and oneiric form of life, i.e., life’s desiring form) rests on processes of the projection through montages of primary, secondary and tertiary retention and protention – was concretised in the form of retentional systems projecting and spatialising movement in prehistoric caves (on the walls of these caves). This led, eventually, to movie theatres and movie screens as we know them today, as phenomena typical of the twentieth century (in the sense stated by Jean-Luc Godard). It should be noted here that this cinema of caves and theatres is staged by Plato at the beginning of book VII of the Republic as a kind of dream: as the dream of that dream which would be the lie of life lived in the cave – i.e., in the pharmakon. Now, we see that whereas the philosopher wants to leave the cave, the film-lover, the amateur de cinéma, would like to get behind the camera or into the screen: what the cinephile loves is the pharmakon and the pharmacological condition itself insofar as it is also the condition of desire. We must now return in a more precise way, however, to the question of knowing what grammatised tertiary retention consists of, so that we may attempt to grasp what is at stake with the advent of digital tertiary retention in cinema history. There are epochs of tertiary retention, and these are the result of the organo-genesis in which consists the transformation of psychic and social organisations that result from the transformation of technical and technological organs. In a general way, the becoming of the pharmakon that is tertiary retention is overdetermined by the play of psychosomatic organs, technical organs and social organisations. The relations between these three types of organs are regulated by therapeutics that define social organisations through social systems (in both Niklas Luhmann’s and Bertrand Gille’s sense of social system). Such therapeutics, which aim to strengthen the curative aspect of pharmaka and to limit their toxicity, are libidinal economies, themselves conditioned by the organology of tertiary retention – which means that an organology of the dream is concretised in each epoch and specifies the primordial matrix of arche-cinema. What type of cinema might emerge from this new stage of the history of the supplement as the concretisation of the arche-cinematic power to dream? To try and pose this question correctly, we must return to the history of tertiary retention such as it is inflected through grammatisation. A text is a fabric woven from literal tertiary retentions taking the form of a spatial linguistic object, whereas oral speech is a temporal linguistic object. When a reader reads a text, this spatial object is thereby re-temporalised: reading is the trans-formation of space back into the time of reading. A film, too, is a spatial object, one that can only be re-temporalised via the mediation of that device we call the projector, just as playing a record requires a turntable. In general, however, whereas I myself play my records on my own turntable, films are on the contrary mostly screened on a projector operated by a projectionist, on behalf of the movie-going public in the movie theatre. In all of these cases, re-temporalisation constitutes a projection in the course of which readers, listeners and spectators pro-ject their own secondary protentions and retentions into the textual, musical or cinematic flux, and select primary retentions, which then generate primary protentions. Consequently, the fact that these selections are each time singular (conditioned by the retentional and protentional characteristics of each of us) means that nobody ever reads the same book as anyone else, or hears the same music, or sees the same film. on the other hand, a writer, a musician or a filmmaker in each case mobilises a common retentional and protentional ground (or fund) constituted by proto-retentions and proto-protentions, typical of a cultural region and an epoch, and which itself takes shape on an arche-retentional and arche-protentional ground, i.e., on the basis of archaic elements that derive from what Simondon called the preindividual (under the influence of Carl Jung and his theory of individuation). 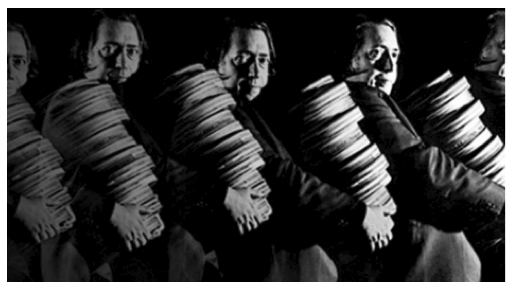 In the course of a projection, whether of a book, a record or a film, the play of primary, secondary and tertiary retention enables the projection of repressed elements, individually as well as collectively. This is why I say in An Organisation of Dreams (UK 2009) that a film is always the arrangement of an individual history and a collective history. 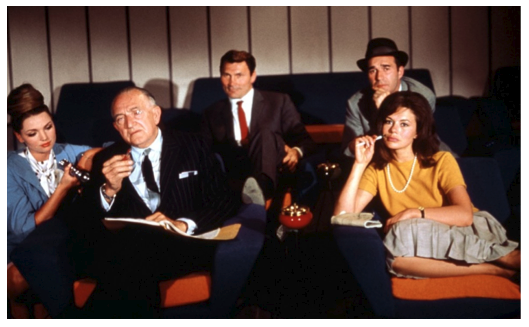 Conversely, and through introjection, the viewer of a film interprets his own retentional and protentional funds on the basis of the transindividual material that is presented during the screening and that comes to meet the audience like an event. 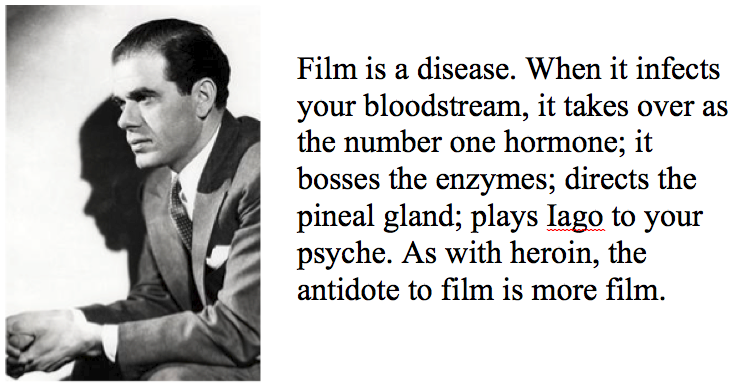 Cinema, however, is a pharmakon, as Frank Capra knew. And this means that the cinematic experience can either reinforce those stereotypes held by the public or, on the contrary, put to work its traumatypes. In order to examine these questions, which will lead to the question of the cinematic condition in the epoch of digital tertiary retention, it is necessary that we more closely analyse the organology and pharmacology of the cinema as an industry of analogue tertiary retention at the service of the consumerist libidinal economy, i.e., as destructive of this economy; as destructive of the libido insofar as it is an economy of the drives; and, finally, as destructive of attention insofar as, as the arrangement of psychic retention and protention forming motives (objects of desire) from the fabric of collective retentions and protentions, it takes care of its objects insofar as they are objects of desire. Cinema is seen by Adorno and Horkheimer as a functional element of a system whose aim is to disseminate an ideology and stimulate consumer behaviour. 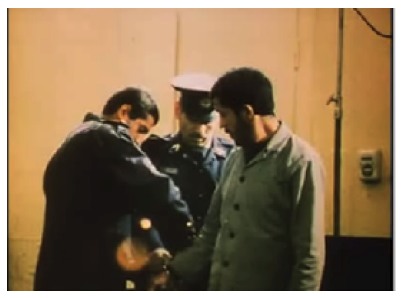 This view of cinema is not fundamentally different from that of the Nouvelle Vague, except that the latter saw cinema as a pharmakon, and not just as a poison (this pharmacology, for example, forms the background of Godard’s Contempt, 1963). The cinematic art, according to Capra, struggles against the disease that is cinema with the means of cinema. This pharmacology, I suggest, is that of desire, i.e., of the dream. What is a dream? It is a compromise between traumatypes buried and repressed in the unconscious, and the stereotypes in which they are clothed in order that they may manifest themselves as latent content. The manifestation of this content remains latent, so that it may be translated in waking life into action, and interpreted through our actions – which may include speaking, as in the psychoanalytic cure. In other words, we must think of this as a loop (i.e., a circuit), the moments of which must not be separated – and this is what Simondon taught us in Invention et imagination: for him, in the imagination, every image founded on sensorimotor schemas, and passing through what he calls the image-object, results in an invention, i.e., an individuation – and a film is such an individuating invention. In reality, it is a matter of the desire of the filmmaker in that – like the desire of any artist – he or she succeeds in sharing it through their work, and in making it, by doing so, a vehicle of the transindividuation of his or her epoch. Furthermore, this transindividuation works by socialising and transindividuating the tertiary retentions of the epoch, reinforcing psychic individuation as well as collective individuation, rather than disindividuating them, i.e., reinforcing stereotypes. Adorno and Horkheimer argue that cinema is, more than anything else, this process of disindividuation. And one could say that this is the drama of cinema, and the drama portrayed and confronted by every great director. This would include, especially, Federico Fellini who, in Intervista (1987), inscribed this pharmacology of cinema within the perspective of its becoming television. 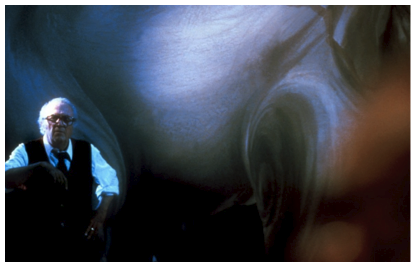 Fellini is a particularly interesting director in terms of an examination of the relation between cinema and dream – and Intervista is indeed a dream, as depicted in the first scene of the film. In terms of the animated image, we are yet to leave the prehistoric age. And the true history of tele-vision begins, perhaps, with Skype. Television is certainly not cinema. But what is cinema? Is it, for example, tied to actual celluloid film? Films are analogue forms of tertiary retention. So are videotapes. But what happens to arche-cinema in the age of digital tertiary retention? like a novelist […] needs to have a library in order to know what is being done, to receive books by others […], so as not to have to read only his own books; and at the same time, a library that would also be a printing press, a print workshop, to know what it is to print; so too for me, a film studio is something that is at the same time like a novelist’s library and a print workshop. We are in this way living through a transformation comparable to that which resulted from the passage from hieroglyphic writing to alphabetic writing. What does all this do to our dreams? This question is at the same time psychological, political, economic and industrial. A dream is a moment within a noetic sensorimotor loop, and it internalises an artefactual (i.e., heteronomic) retentional organisation, into which the dream tries to introduce a coherence – a coherence with desires that are, however, in conflict with the social organisation that is concretised around this organology, and which incarnates a superegoistic structure. Such a structure produces much stupidity: through the use of collective retentions in order to keep a rein over individual and collective traumatypes, it generates stereotypes. By constantly reinforcing these stereotypes, and by taking them to the extreme, the consumerist capitalist economy, which is initially cinematic and then becomes televisual, in the end destroys the libido, which decomposes into the drives. This proves deadly for the power of cinema to dream: aside from some very remarkable exceptions, cinematic dreams become drive-based nightmares, i.e., horror movies. The film industry has been the capitalist stage of the libidinal economy and of the organology of dreams – which are the workshops or studios of this libidinal economy. It was in this capitalist and industrial context, in which cinema is put at the service of consumption and leads eventually to television, that Capra understood cinema above all as a form of dependence that “takes over as the number one hormone […], bosses the enzymes [and] directs the pineal gland.” This pharmakon is dangerous because it may take the place of something that you, your body and your brain, ordinarily knows how to do itself, which is also to say, to produce – “as with heroin,” as Capra puts it, i.e., in that case, in relation to endorphins. Since the pharmakon turns out to be better at producing it than you are yourself, you ‘unlearn’ how to produce it. This is the very fate that befalls the heroin addict. It is also what happens with writing, if we are to believe Socrates. And it is the meaning of industrial organology taking the form of proletarianisation, which Marx described in the first place as a loss of knowledge. In the case of the cinematic pharmakon that becomes the televisual pharmakon, which proletarises consumers and deprives them of the capacity to produce their own savoir-vivre, of the capacity to know how to live, it is the primary and secondary identification processes, which constitute the condition of formation of the psychic apparatus, and therefore the condition of production of libidinal energy, that are effectively short-circuited. That cinema is an industry means that its model and means of production have rested on an opposition between production and consumption: this opposition, according to Adorno and Horkheimer, expresses itself as a teratological exteriorisation of the transcendental imagination. But what they fail to see is that the problem is not exteriorisation, which has always already begun, but rather the short-circuit that inevitably results from the hegemony of de-symbolising, disindividuating and imagination-destroying cultural consumerism, because it reinforces stereotypes and represses traumatypes. Digital tertiary retention establishes a new industrial organology that poses all these problems in new terms that make possible new dreams – and, on this precise point, we must also relate this to the projections made possible in France, for example, by the Super-8 camera (as Alain Resnais, for example, shows in Muriel ou Le temps d’un retour ), and the 16 millimetre camera in the 1950s. 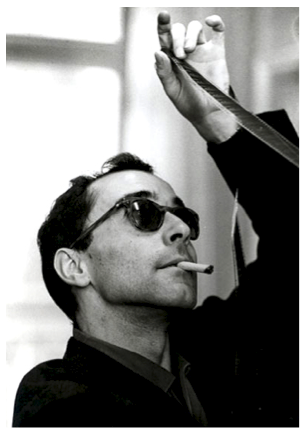 With regard to what was said by Jean-Luc Godard in his Histoire(s) du cinema (France 1988-1998), a project anticipated in his Introduction à une véritable histoire du cinéma, in which he dreamt of a film library as has today become available online – well not quite yet, but it will be soon, and in the true sense, for soon we will be able to browse films and access them in conditions made possible by their digital grammatization, as foreshadowed by Lignes de temps – in regard to Godard’s dream, we must understand that his films are immediately and completely underpinned by this dream and its organology. And this suggests that we may have much to expect from digital organology, insofar as we know how to desire, to dream, and to concretise this positive pharmacology. 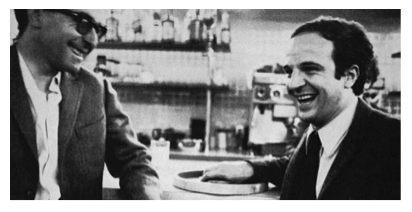 In the late 1950s, when Godard and the critics of Cahiers du cinéma were dreaming, when cinema was the dream, and because their dreams were organologically constituted by the cinema, these lovers of cinema – Godard, Truffaut, Resnais and so on – became the Nouvelle Vague of cinema through their political and economic thought of an emerging organology, just as Fellini had such a thought in relation to cinema in general: Fellini’s cinema, like the appearance of the Nouvelle Vague, derived not from an organological causality but from an organological conditionality, i.e., a pharmacological conditionality – so that, for example, in the context of Berlusconian television, Fellini rethought, in the course of a dream, the Mussolinian pharmacology of delusion that gave birth to Italian cinema. In the age of Cahiers du cinéma, the appropriation of the 16 millimetre camera radically changed the relations of production at the core of the cinematic machine, and thus changed the cinematic imagination of filmmakers and their audiences, who became, in a structural way, amateurs, film-lovers: one of the very specific features of the Nouvelle Vague was that its public was composed of film-lovers. Now, these filmmakers were themselves lovers of cinema who took hold of the 16 millimetre camera in order to show what they had seen in 35 millimetre cinema. One cannot see the films of the Nouvelle Vague without being a lover of cinema, just as the directors of the Nouvele Vague were themselves film-lovers. 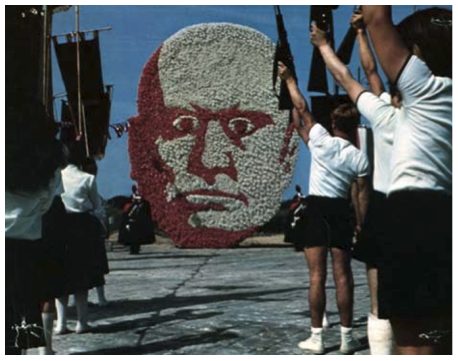 At the beginning of Intervista, Fellini is in the middle of a dream. 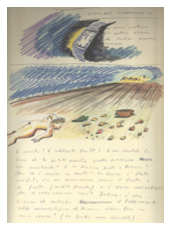 The film shows a dream that builds on notes made by Fellini in his sketchbook. It is a question, here, of note-taking: of the organological conditions of the dream as it is elaborated through the taking of notes. What is a dream, if not a kind of montage of these notes that are day-residue, to speak in psychoanalytic terms? Intervista, however, is a waking dream, a kind of daydream. But what is a work, an oeuvre, in general, if not such a dream – made out of artefacts, i.e., fashioned from transitional objects of all kinds? During a dream, I transindividuate within myself, in a way that runs counter to dominant transindividuation – the dream puts into movement traumatypes that are hidden behind stereotypes, which is also exactly what happens in any good movie – yet my power to dream is the condition of my power to act, the one like the other being conditioned by the same organological powers and impotencies. By articulating and arranging organs, the brain with the bladder, for example, as a source of internal sensations, or with the ear, as a source of external sensations (these are examples given by Freud in The Interpretation of Dreams), via a given symbol, which is always one of tertiary retention, i.e., an artificial organ, organology mobilises phenomena occurring during the day (day-residue) that it brings up – as Fellini did with his memories of the years from Mussolini (at the beginning of Italian cinema) to Berlusconi (in this age of television). Nocturnal organology is not daytime organology. 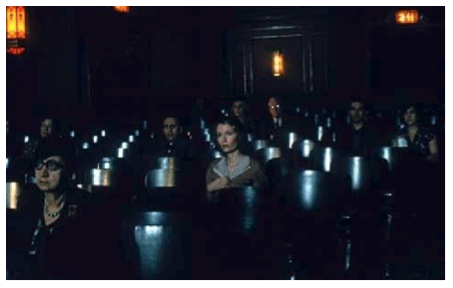 This passage from night to day, a difference which the industrial dream projected in the movie theatre blurs through ‘day for night’ techniques (la nuit américaine in French: the title of François ruffaut’s film), may result in traumatypical liberation but in the guise of stereotypes – turning cinema into a political power to “harm stupidity” by working with it – through these stereotypes that are the pharmacological condition of stereotypes. In this regard particularly, Intervista is exemplary. We are projectors (as Godard said) capable of projecting traumatypes, of socialising, of transindividuating on the basis of our means of production, i.e., on the basis of the organological powers and knowledge of which we are capable – and that we are capable of putting to work. And this capacity forms the stakes of a political struggle, especially in the cinematic context emerging from the epoch of digital retention. The economy of the means of oneiric production raises the question of the ownership of the means of production of the dream, the imaginary and the symbolic. 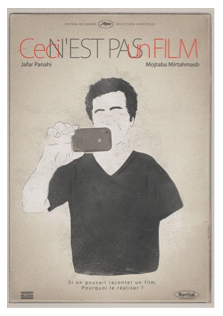 In Close-Up (1990), Abbas Kiarostami tells the story of Hossein Sabzian, who finds himself in prison because he se faisait du cinéma, as we say in French, meaning that he gets caught up in his own lies – and in his lies, in his movie, he dreams of making a movie. In other words, there are, for Sabzian, two dimensions to his cinema: the movie that he lies about [le cinéma qu’il se faisait], and the movie that he cannot make, the film that he does not get a chance to realise, to direct. Kiarostami has made a film, and in a way he has realised Sabzian’s dream – which was to make a film. 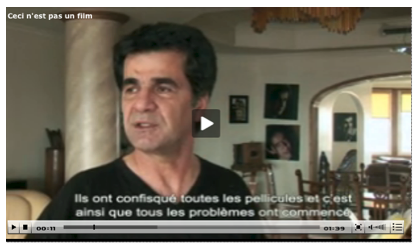 Kiarostami interprets Sabzian’s action by suggesting that Sabzian dreamed of passing into the screen. It seems to me, however, that, in fact, his dream was to get behind the camera. 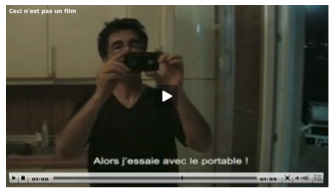 Sabzian’s dream was to make films: he thus had the same dream as Godard, Resnais or Truffaut. Close-Up shows that this dream is, to a degree, shared by all the Iranians we see in the film – not just Sabzian. 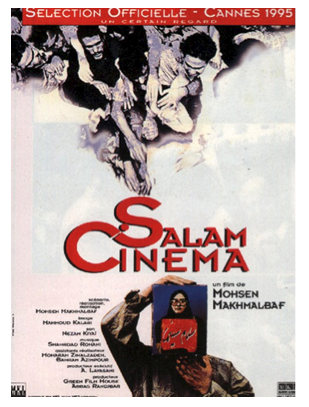 Furthermore, Mohsen Makhmalbaf has Iranians speaking about their dreams of making films in his own work, Salaam Cinema (1995), a film that was shot in the wake of Close-Up. In Close-Up, everyone is more or less a film-lover. As for Sabzian, a poor, unemployed resident of Tehran: he manages to find the means, even though he barely has enough to eat, to buy a copy of the screenplay of The Cyclist (1987), a Makhmalbaf film that he greatly loves. He was so in love with it that he wanted to study it further – and we see during his trial (filmed by Kiarostami) that he had been writing screenplays for a very long time, and that he accuses his father of having taken him to the cinema, i.e., of having initiated him into and encouraged a passion that would eventually lead him to prison. An ancient thesis states that, in fact, the origin of technics is the dream and that, as such, technics can never be defined as the causal factor, since the cause of any invention must be the idea through which it has been dreamed up – one could say the fantasy, or the protention. This is, in a way, the argument of both Bazin and Georges Sadoul. Sony, a large manufacturer of film and audiovisual equipment, has based its advertising on just such a representation of the genesis of technics. In reality, dreams generate technics, which itself generates dreams: dream and technics cannot be separated. Marc Azéma opens his book Préhistoire du cinéma by referring to dreams: he says that while animals dream, only human beings externalise their dreams. I agree with him, and I believe that this is how tertiary retention forms. This exteriorisation of dreams, as the capacity to produce what Simondon, at the beginning of Imagination et invention, called, precisely, invention – which he defined as the fourth moment of what he referred to as the cycle of images – presupposes tertiary retention as the process of grammatisation of arche-cinema, i.e., as the concretisation of this arche-cinema, but which would also be its transformation. The transformation of desire by this arche-cinema is what makes possible technical and technological projection and invention, on the basis of earlier technics and technologies – forms of tertiary retention generate, under certain conditions, other forms of tertiary retention, when what we refer to as the technical system of the imagination or the ideas has reached its limits. We ourselves, today, are at the limits of the imagination and ideas generated by analogue tertiary retention, and we are entering into a new system: the digital system. I do not mean that the invention of digital occurred because the analogue system had reached its limits; I mean that the oneiric being that we are, a being that is also noetic, is essentially constituted by the co-evolution of its dreams and its technics. 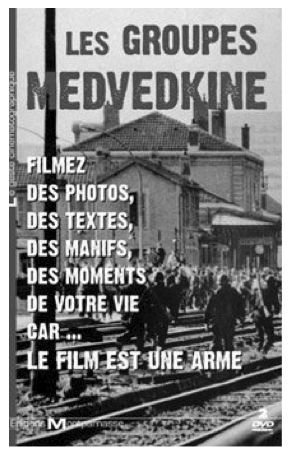 Sabzian’s dream was in fact of something that could actually take place, something that the Medvekin groups – along with Chris Marker, inspired by Alexander Medvedkin himself – made real; something that the militant workers of Besançon actually managed to bring about. These were not exactly French Sabzians but, to a certain extent, they resembled him: going on strike in the extreme conditions of 1967 while, at the same time, wanting to incorporate into the factory a library and a cinema, as Paul Cèbe actually did, and at the initiative of these groups – producing something that is of the order of an organological dream. Cinema […] enables you to impress an expression and at the same time to express an impression; there are both. This can be linked to what Simondon said about the cycle of images. Godard, too, speaks of a cycle of images – he thinks cinema, however, in relation to desire, whose pharmacological and organological conditions he investigates through cinematic invention. People should write scripts on video, because seeing a shot would help you decide how or how not to shoot it. Since everyone has a TV […] they have to make people forget that it can be used to see. Cinema […] impresses in advance the great movements that are going to take place. It is in this sense that it can show diseases before they happen. 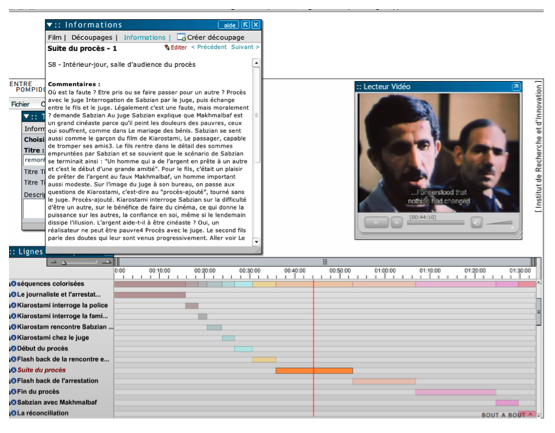 The digital could and should eventually fulfil the expectations of Godard’s dream of a library of cinema that would also serve as a print workshop, as well as Sabzian’s dream of offering everyone the possibility of making films – provided a politics of the organological condition and the pharmacological situation of human dreams is placed at the heart of political economy. This means that the political world must make this its motive. But this will not be possible if the film world (whether amateurs or ‘professionals’) does not mobilise itself in this direction. Karl Marx argued in The German Ideology that idealism is based on an inversion of cause and effect that forgets the role of the means and relations of production in the genesis of ideas – comparing this illusion to the reversal of the image in the retina. 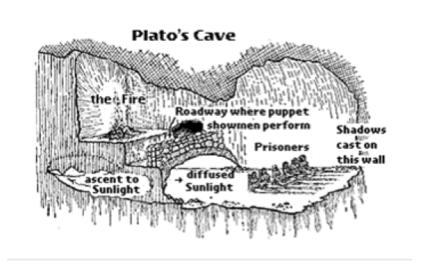 For Plato himself, the cave was a place of illusion – and he founded idealism by suggesting that it is necessary to get out of the cave in order to re-locate what Adorno called the light of day … In short, it is necessary to leave the movie theatre. What Sabzian wants, and what Godard, Resnais and Kiarostami want, what all amateurs du cinéma want, all film-lovers embodying this arche-cinema that Plato described but without having any way of seeing the scope of what he was describing, was not to leave the projection room: it was to get behind the camera. Such are the stakes of the digital, and this constitutes a new page, still completely blank, of the history of arche-cinema. Sigmund Freud, The Interpretation of Dreams, in James Strachey (ed. ), The Complete Psychological Works of Sigmund Freud, volumes 4 and 5, London: Hogarth Press, 1953. Bernard Stiegler, What Makes Life Worth Living: On Pharmacology (Cambridge: Polity Press, 2013). D. W. Winnicott, Playing and Reality, London & New York: Routledge, 2005. Bernard Stiegler, Technics and Time, 3: Cinematic Time and the Question of Malaise, Stanford: Stanford University Press, 2011. 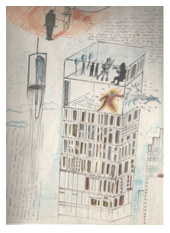 On this subject, see Gilbert Simondon, Imagination et invention, Chatou: Éditions de La Transparence, 2008. Jacques Derrida, Of Grammatology (Baltimore & London: Johns Hopkins University Press, 1998). 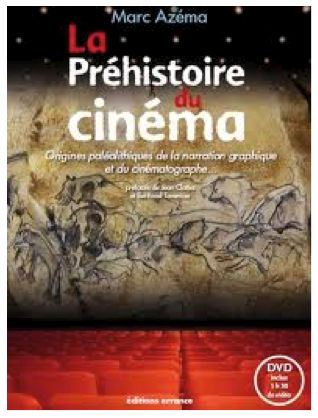 Marc Azéma, La préhistoire du cinéma: origines paléolithiques de la narration graphique et du cinématographe (Paris: Errance, 2006). 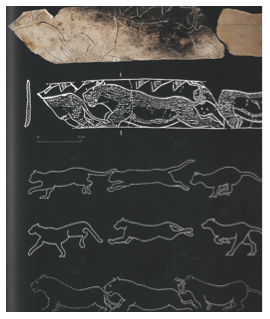 And see also Azéma and Florent Rivére, “Animation in Palaeolithic art: a Pre-echo of Cinema,” Antiquity, no. 86 (2012), pp. 316–24. Federico Fellini, A Book of Dreams (New York: Rizzoli, 2008). 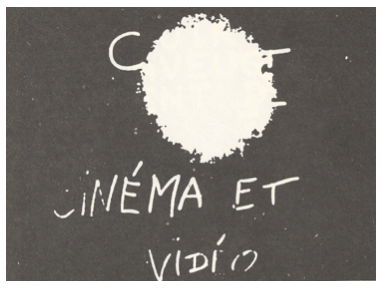 Jean-Luc Godard, Introduction to a True History of Cinema and Television, Montreal: Caboose, forthcoming. Godard, Introduction to a True History of Cinema and Television. And we should mention here, for example, what Godard said about money and the image or the likeness of Louis XVI, about the representation of the king on coins and its role in the process of transindividuation under the control of monarchical authority.